Status update of Tuar Daal, Vegetables etc. Sorry for late update. Here is the update on Tuar Daal (flowering now), vegetables etc. Below the biggest Tuar Daal (Red Gram) plant I have ever seen. Height 6 feet, Width 5 feet. It can also be seen in below video. Sorry for not good quality video, the weather was cloudy. You must be wondering what's happening, there is no update on the Farm construction, plantation etc. The farm construction work is currently on hold after Neelam storm due to some personal reason under my control. The plants are doing well, we had spread seeds of Kushmal, Red Gram and Mustard after Neelam and they have germinated as well but after that there was no rain so not doing quite well. In the mean time we had two visitors as well and they had enjoyed and gave some plants too. As usual, will keep updating the progress. Thanks for your time to read and follow. Overall progress of the farm - Tuar, House, Coconut, Vegetables etc. Here is the progress of my natural Farm. 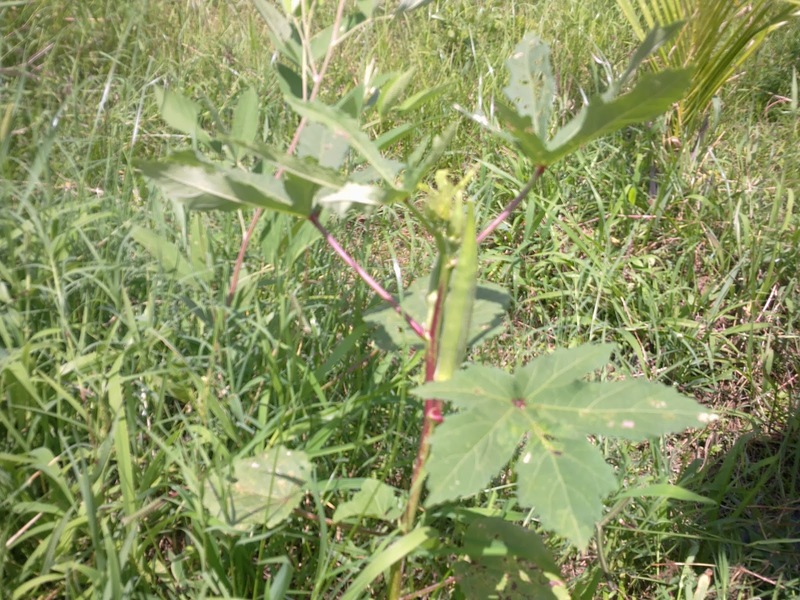 In the first part of the video I show the status of Tuar (a legumes and pulses we generally etc in India) or Red Gram that was sown naturally without tilling, cultivating the land. We had just spread over the grass in the rainy season. They were amid the grass in the whole rainy season and when we cut the grass they have grown good. After cutting the grass in the same patch, we had spread Mustard. Unfortunately there were not rain after that so they had grown a little but dried up. As we are again getting rain so we have spread Mustard again. 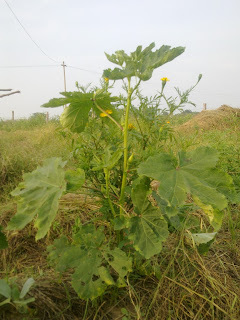 Later, I have show the foundation work of my house in the farm and then the status of Coconut plants, in the end of the video, I have also covered the Bitter gourd and lady finger plants status. Please keep visiting, commenting and suggesting stuffs to me. I have just started the foundation digging work for my house in the farm. Below are some pictures. The area of the house will be around 30'x24' (Width x Length). Three bed rooms and a Baramda (portico kind of stuff in front). I am expecting that it is going to cost me around 1.75 Lacs. Will keep posting the update, stay tuned. I am happy to share the news that one of the renowned organic farmer of Vidharva (Maharastra) Mr. Vasant Futane ji has visited my farm today (15-Oct-2012). He has been doing organic farming for past 30 years in his 30 acres of land. I love the way he entered to my farm land and started analyzing and finding out the grasses types, its root design etc. He was looking like an expert in all these things and of course he is. I had a wonderful day today discussing with him about the farm, what to do & how to do etc. 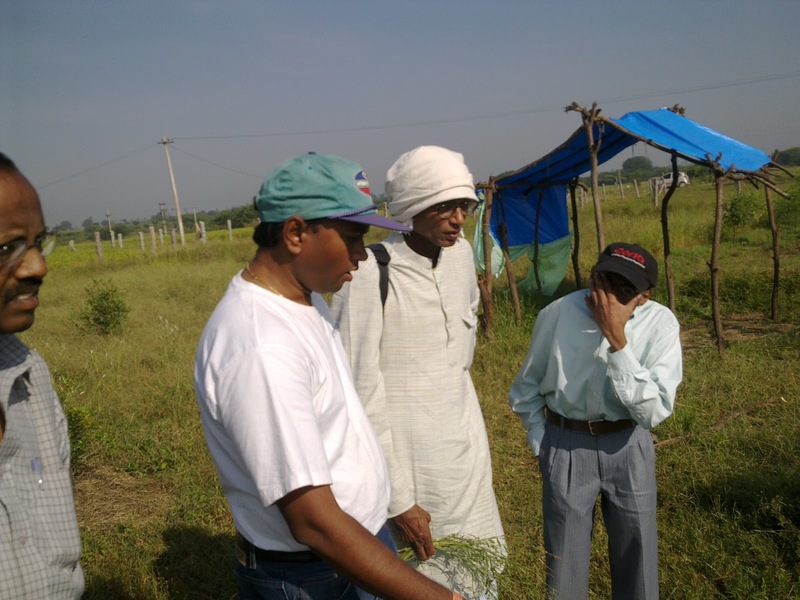 He provided a many valuable inputs to improve the farm, about the plants etc. Thank you very much Sir (Vasant Futane ji) for your time and valuable inputs. Kindly keep suggesting and guiding all of us. What a size!!!! 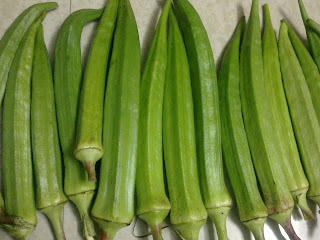 The typical size of the Lady fingers today was the size of my palm, look at the Lady fingers size below. 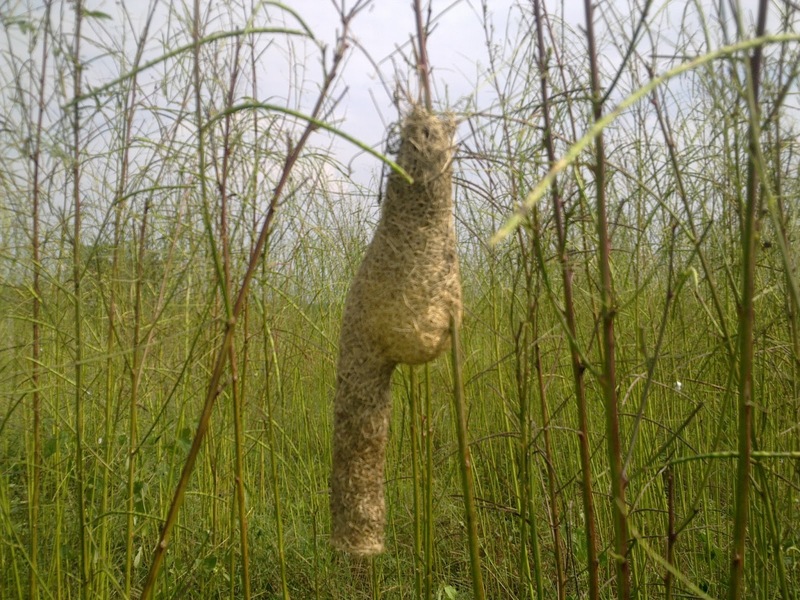 In another plot where naturally grown grasses are there, I saw a peculiar type of nest. 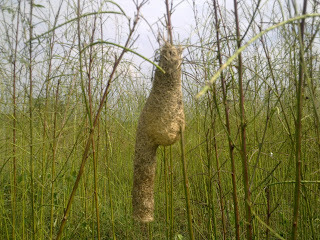 Perhaps this is of Humming Bird nest but not sure. What a nest ! In below video, I have tried to compare the Lady finger planted in my neighbor's land and my land. While my neighbor uses all kinds of chemical fertilizer and pesticide; I do not use anything, not even organic pesticide. Hope above video is convincing; at least I am convinced that my way ie. Natural Farming is a better way for farming. Thanks for reading, do keep the comment and suggestion flowing. Vasant Futane - An organic farmer from Vidharv, Maharastra. Doing organic farming for past 30 years. Yugandhar - A person who has amazing talent in farming related subject. Very eager to do farming. K. Suresh - A person having sea of knowledge in Farming, Permaculture. Very nice person and full of farming knowledge. Sridevi - A professional and farming enthusiasts particularly interested in floriculture. Thanks for all of you who has already visited my farm. My farm is open for all to visit, contact us to visit. In this thread I am going to list all the good links I will come across related with health benefits from the trees and its parts. Today, I was surprised to see the growth of the Lady fingers, look at the pictures below. The growth of Lady fingers are awesome awesome awesome (touch wood). 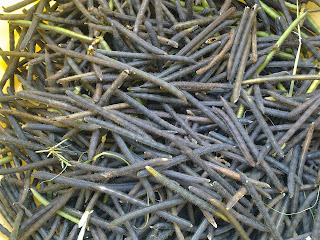 It goes without saying that we had a good harvest yesterday and a day before. We had a very good Lady finger Bhujia. Nice real lady finger taste ! Do keep the comment and suggestion flowing. Here is the current status of the vegetables and fruits trees planted. Lady finger is doing quite good. Pumpkins too. Overall I am happy with the progress we are making slowly. I had a corn from my farm today and it was yummy and tasty. Full of milk and very tasty. Hope you have enjoyed watching the video, let me know your comment or suggestion. Me too, when today I went to my farm; we were welcomed by a Turtle. The first thing that came in my mind is that because our farm is free from Chemical fertilizer or pesticides so all different kinds of animals are also liking our farm land and coming in from outside. The turtle was about 6" in length. We have tried our best to make this turtle happy by putting into one of our pond. Hope he/she will feel happy about it and enjoy life. To get the new post notification directly in the email, feel free to subscribe by clicking here. 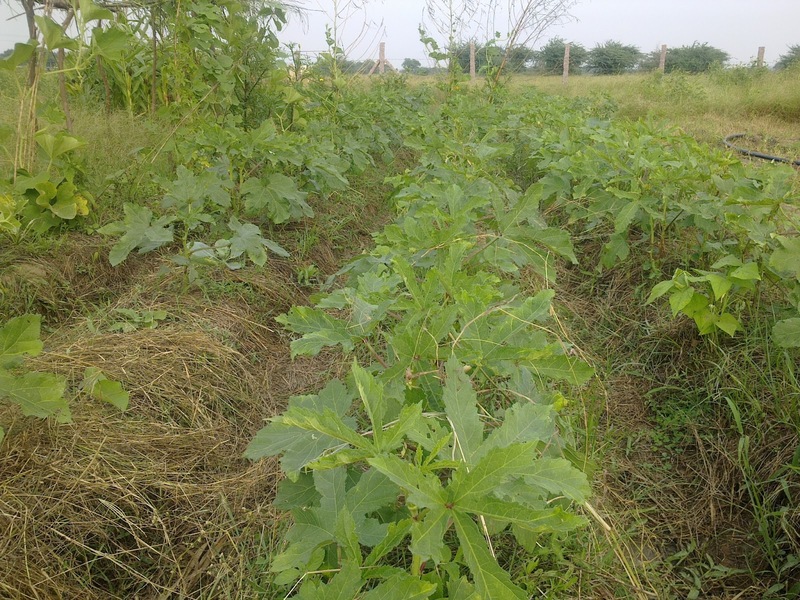 Here is the status of Vegetable and Fruits plantation in Rameshwari Natural Farm. Carrot - perhaps didn't know how to plant so tough to detect where are they amid grasses. May be because this is our first year of Natural Farming and no chemical fertilizer or pesticides so the growth is not very good. I also noticed that the seeds that we have planted from our own store (in house seeds), are doing excellent but the seeds that we have bought from market is not doing good and some how surviving. All seeds bought from market is from standard company and costly. Some of them were Hybrid and some were normal. Please watch this video and suggest the measure to revive the fruits plants and overcome the insects on vegetables naturally. Coconut - few have died, rest are some how surviving. The leaves are becoming yellow and drying. May be because of more water nearby the roots. I have noticed that some of the plants having more water nearby roots are doing good and some are becoming yellow so not sure the reason of this. Guava - Surviving, one plant's leaves have been eaten by insects. Anjeer - One has dried up because a person passed urine on it thinking it will work as a fertilizer for that plant but it started dying. Not sure how to revive it. Important: Note that before planting the fruits trees I have not get the soil checked and even I do not want to do this. I have decided to use minimal amount of modernized techniques in this farm and want to go for completely natural farming. However would like to understand why these plants are not doing good. Thanks for reading and watching the video. As usual, would be more than happy to hear from all of you. To get notification in the email about the new post, please subscribe by entering your email id in the right panel Subscribe box. Here is the current status of the vegetable plantation after mulching. We have heavy grasses in our farm and we are cutting those grasses and mulching on the stage that we had prepared for the vegetables. There are many benefits of mulching as you might have read about and some of them I am listing here on top of my head right now. You get all above FREE !!! As said in the video, I have a lot of grasses in the farm if anyone can give me an idea on how to sow seeds on these grass fields I would be really grateful. 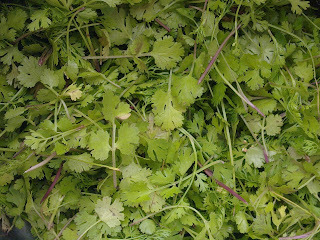 Here is the second yield of our Rameshwari Natural Farm, Coriander (of course farm fresh). This was our second effort. In the first effort we had just spread the Coriander seeds on the flat surface without digging and loosing soil and weeding (on top of the grass) and hardly one or two sprout. 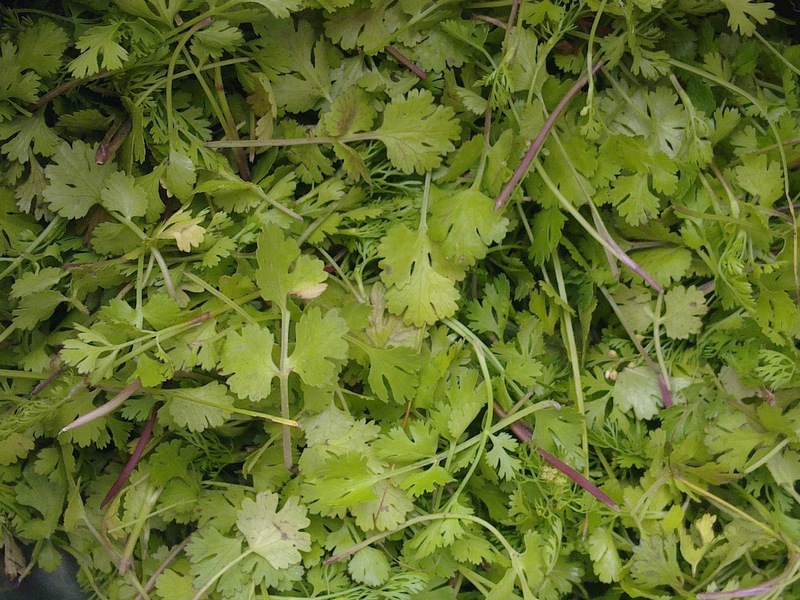 This time we spread the pond soil and there was almost no grass and spread the seeds, we get little Coriander, we started irrigating and finally we were able to harvest enough Coriander leaves for two or three days of consumption in the first harvest. We had also spread Green Gram seeds directly, without ploughing, weeding or cutting the grasses. Because of a lot of grasses many didn't developed well (because of water logging and on top of heavy grasses). We noticed that where there were less water logging, these Green Gram come up very well. Above is the yield of Green Gram without any fertilizer, pesticide, ploghing, weeding. Its organic and natural (not even organic fertilizer or pesticides). Still the taste to be checked, will update this thread shortly ! Awesome Awesome Awesome, we had Coriander chutney and initially the taste looks different but the more I eat the more it started tasting good. I remembered my old days of coriander (Dhania) chutney. The taste was so good that I ate half a plate of rice with just coriander chutney. Hummmmmmm...... delicious !!!! 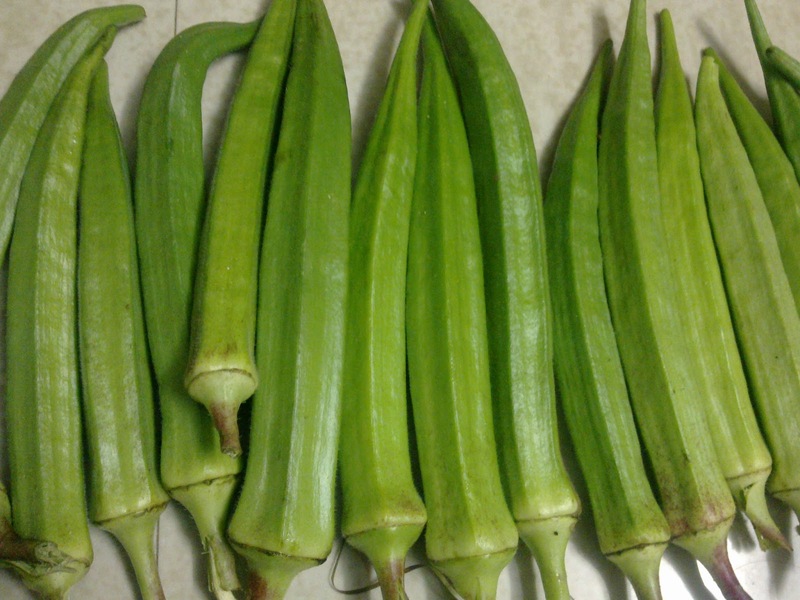 This is the first yield of our Natural Farm - a Lady finger. You may wonder, why we are so happy? Because this was sown by us and we have been watching its progress for last couple of days. I am feeling so so excited about it. Seeing plants growth is a huge satisfaction and peace of mind. Thanks for reading and watching and subscribe for our posts to get latest progress in our farm. 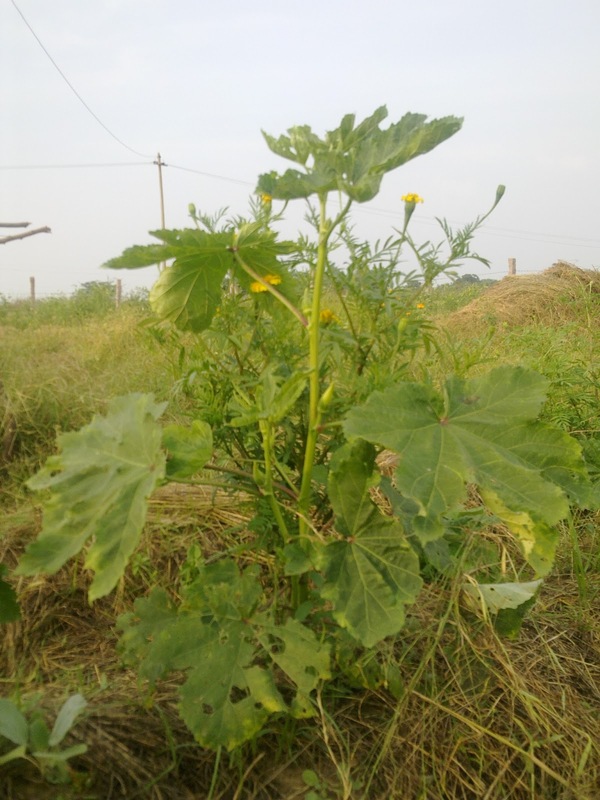 Apart from above trees plants, we have also planted some vegetables like Culiflower, Tomato, Lady finger etc. but not sure how they will do. Thanks for reading and do not forget to subscribe for the posts to get new posts directly into your email. After spending countless number of hours and spending 90K+ INR here is the result of the bore well. Its just giving 1 hour water from 1" pipe, may be about 2000 liters and then drying up. Is there any way to revive this? I am so excited today (13-Jul-2012) that Raju Titus Sir (a renowned and respected personality of Natural Farming in India) visited my natural farm today. Thanks for Yugandhar and Pawan for arranging my meeting with Raju sir and thanks a lot to Raju sir for giving me enough time. It was priceless moment for me when this legend stepped into my natural farm. He advised many things and appreciated my effort for last few weeks I have been doing in my farm. I have been reading about natural farming for last couple of months and knowledge given by Raju sir was like a boost in whatever I am doing. All his suggestion and knowledge was worth listening and implementing. I am going to implement all his suggestion to the extent possible for me. I had also an opportunity to take him to my house where he meets my family. We as a family enjoyed the whole visit and I hope Raju sir too! Thank you very very much Raju Sir, I am blessed to have you in my farm and opportunity to meet and talk with you. If you are following my post, you must be knowing that how frustrated I am with the bore well drillers , finally I have managed to get hold of one bore well drillers and the vehicle arrived after a month approximately. On 5-Jul-2012, the bore well drilling vehicle arrived. Below is the video after just finishing the worshiping. It all started at about 2.00 PM. First few feet (about 5 feet), its soil after that moram (red small stone mixed of soil) and then black moram. At 80 feet rock started and till 390 feet, it is complete rock. Earlier I had decided to drill only till 250 feet or so but after not seeing even a single drop of water I decided to let it go. In every feet I was loosing few hundred rupees but I let it go. At 390, the drilling stopped as the bore well drillers get exhausted with their pipe. At this point we started getting some moist rocks or you can say muddy stone particles. They went for the additional pipe (its another story how resistance were they to bring the pipe). After 2-3 hours again the drilling started and immediately after starting the drilling we got water coming out from the bore well as due to gap of 2-3 hours some water got deposited in the well. Again when things started, we get water intermittently at around 420 feet 435 feet and then again all rock. The bore well drillers and others sitting their declared this as failure bore well. It was about 11.00 PM. I was thinking to get another point and decided to get one more drilling. After first drilling, I was already loosing whopping INR 46,000/-, this includes only drilling charges. If I would go for another bore well I would loose close to 1 lakh just for drilling with all uncertainty whether I would get proper water or not. Loosing hard earned money like this is really painful experience, believe me. However, I thought let it go because if water is there all looks green otherwise its difficult. Initial 80 feet drilling with wider pipe for casing 120 per feet = 9600/- (surprisingly this should have been excluded in the initial 200 feet, but it is not. I do not understand the logic). At around 1.00 AM, bore well people decided to start the drilling another point in the morning. We also went to sleep and again woke up by 5.00 AM morning. At 5.00 AM we come again and dropped few small stones and we got the water sound after 9.00 seconds (so the water is at 88.2 meters approx - 9 seconds * 9.8 meter that comes around 283 feet). The bore well people said we can go ahead with this bore well with single phase motor and this is enough for an apartment like need but not for the farming. As I am planning for natural farm where I feel there is no huge water requirement so I thought lets try this. I got the casing done till 80 feet and have left it as it is. Will update this when I got the motor and start getting water out of it. After planting fruits trees, I noticed that there was gap of rain and my plants were looking dull. As I have already tired following up Bore well guys so decided to get the small pond dug. Have manged to dug two ponds (small in size - 20'x10'10' - w, h, d). 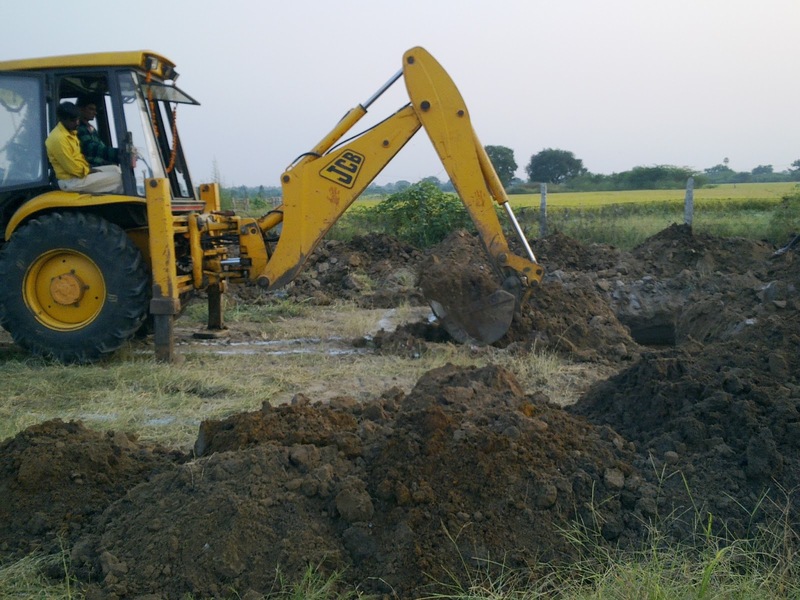 It took 3 hours for 1 JCB to dug 20 feet length, 10 feet width and 10 feet dept pond. The first pond has been dug in almost center of the farm and the 2nd one is dug almost last of the farm. The idea is to store the rain water and then water these plants with it. It may also work as percolation tank so that rain water percolates to the ground to increase the water level. A lot of work needs to be done, going step by step and slowly. After spreading rice + green gram seeds and sowing some vegetables seeds, we have just started planting some fruits trees. The total cost of the plants (around 125 in number) were about INR 14K including transportation. The labor charges of planting each plant was INR 30. We spent around INR 20K in total to plant almost 125 seedlings. Initially the plan to plant coconut trees were to base on Bhaskar Save surjmandal methodology but I felt the distance between two trees where very less (6 feets and then he cut down 3 trees in a surajmandal, so even if I was keeping 8 trees I felt the distance is too less for the leaves to spread) so I decided to go ahead with the traditional boundary approach. I have planted coconuts at the distance of 15-16 feets in between and the distance from the boundary is almost 10 feets. Mango trees are planted almost 20 feets distance from the coconut trees and 40 feets distance from each other. Then bottom top approach is followed, means smaller trees starting from east side and as we go west the taller trees are planted. For example starting from east to west, Leechi, Sapota, Pomogranade, Amla, Mango, Coconut. All the fruits trees apart from Coconut and Mango are planted at the divider of the plots so that the sun lights doesn't spread across the plots and I can sow some seasonal plants or paddy as well even when the plant grows bigger. I know I am not the best but whatever limited knowledge I have, I just thought the best and have planned the trees plantation. Lets see how it goes in years to come. Of course some plants like Manago (two crops a year), Star fruits, Lemon grass, Pomogranade, Anjeer, Karipatta, Betel nut have been planted nearby the plot I am going to construct home. Any suggestions or feedback are more than welcome. Thanks for reading. Recently I have bought agricultural land for my natural farm I am going to plan. I have gone through many hassles, confusions etc and I want to pen down here so that it will help others folks who want to do the same. First I was searching for agricultural land and browsed many websites, googled about agricultural land. Called many folks over phone number I got from websites. Many folks promised that they are going to see the land and come back. Many folks said there is no land in my budget. Many said that you will have to go 100 KM from Hyderabad. My budget was 3-5 lacs per acres. Finally I called this broker on this Shivratari and he said that a land is available in my budget. I and my family immediately followed him and saw the land (27KM from my flat). In the first look, I liked it. The location, place and surroundings was good. I told the broker that I want to buy this land. We went to a local person and through him we talked with the owner of the land over phone (generally brokers doesn't allow to talk with the owner immediately but this broker was good enough). 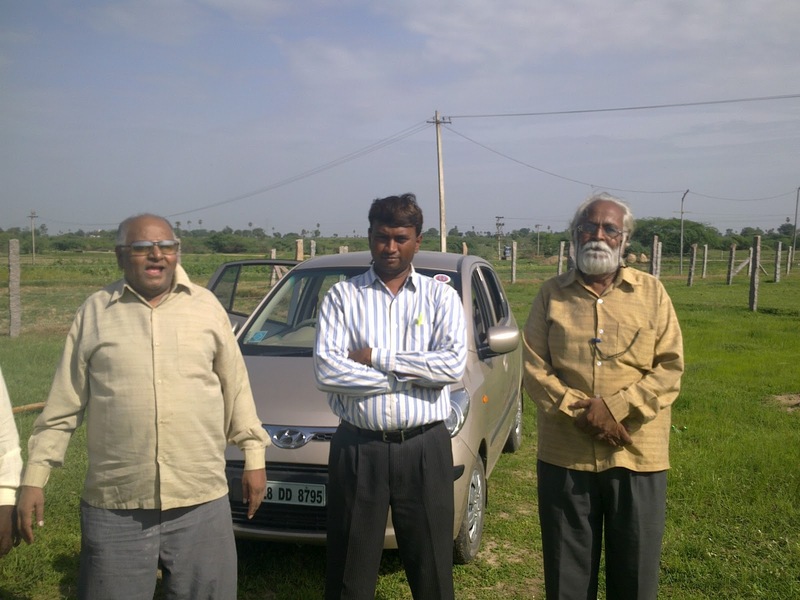 We decided a place to meet nearby Patancheru, Hyderabad and immediately meet there. We came up with some negotiations. The price of the land was much more than my budget however the location and locality was good to I dared to buy this land. We went to owner's house and got the original paper (Registration paper and pass book) xeroxed. Came back to home and started taking suggestions from friends and colleagues. Many folks suggested to go for legal opinion, EC, get the bore well point before buying etc. Got the measurement of the land done. I had insisted to bring a good person for the measurement and the broker said he will. He brought one old aged person who measured that land with Karis (iron chain) and told that land measurement is correct. I insisted for the map and plot numbers on the map. He took 2K for this, much more than told by the broker. After few days he gave a map with length and width of the area on a waste paper, I was on top of the temper that measurement guys has not even spend a rupee to buy a good paper for this. I insisted for a good map with plot number written on it but till now I am waiting. People are cheaters here also, beware of them. The lesson learnt is do not give total amount unless your work is done! I got the EC of the land. I talked with Patwari of the village and he said ok for this land. They are so lazy that he even updated his record by seeing the xerox paper I had taken for this land. He took 200 rupee and was asking for 500, strange ! After a lot of confusion about the plot number (survey number), I decided to get some opinion as suggested by many friends. I went to a legal adviser (an advocate) who is known to one my family friend and he saw the paper and told to bring Khasra Pahani (the land record for last 50+ years). It took me around a month to get the Khasra Pahani and couple of thousands of rupees. Took the Khasra Pahani to the Advocate, this time he says that looks good but where is the village map, I showed him village map that I had got from broker. The map condition was pitiable, almost broken, teared from every corner. The advocate says "Even God can't tell where is the land on this map". I said what is the solution, the advocate said if you believe them, buy this land otherwise forget about it. If you have to buy this, first get the fencing done before agreement itself and then go for agreement. You all know that no land lord will allow to get the fencing done before agreement. I called the broker and said the same thing; at this point I had made my mind and that I am not going to buy the land. The broker called one fine day and ask me to come to MRO office to inquire about this land. I went there with half mind. Talked with Patwari there and many others who were available, got the map of the village and was trying to figure out where is the survey number for this land. As the map was not clearly visible, no one could tell where is the survey numbers. The broker said that Tahshildar ( or I do not know the official name - the person who measure the land in that area) is out to another land and will come by 3 PM and I can talk with him. I waited for about 6 and was disappointed and was planning to come back. After few minutes this person came, I went to him and asked for the map and survey number on this map. He showed me the map and survey numbers on the map, it was satisfying and I could convince that this land is genuine. I got the xerox of the map for my purpose and another local person along with me said give him 200 rupee but Tahshildar didn't take any money. Surprisingly the assistant of the Tahshildar came outside and was asking for money and I paid INR 100 too. After verifying the EC, Khasra Pahani, Village Map, talking with the neighbors, Patwari I was satisfied and convinced about this land. I decided to go ahead with this land. I asked for the agreement and we got it done. Paid the money through account payee cheques. The next step was fencing of this land, you can read more about fencing my farm land here. Huh! a long story about how to buy agricultural land. It was tiring experience, very confusing, frustrating, discouraging but ultimately got satisfaction for what I wanted to do. I hope this will help someone like me who wanted to buy agricultural land and was searching for help on how to go ahead with this. Thanks for patience in reading this long 20 steps processes. Got the Bhumi poojan done and back home. Awesome experience ! I and my family cordially invite you all for the Bhumi Poojan tomorrow (30-May-2012) at 6.00 AM in Amdoor village nearby Begampet (It is around 12.5 KM from Patancheur to Daulatabad road), Patancheur, Hyderabad. From Begumpet, turn right and go to the road that goes to Amdoor village around 2 KM. Nearby a transformer in the left, right side you will see a fencing plot. Any difficulty, please call on +91-77025-60638. It took around 50K to get the registration done (the cost including registration charges, bribes etc. ), I was surprised that even if your documents are correct and authentic, you will need to give extra money to the registration offices. Its INDIA boss! However, when I gone to my farm again, I noticed that he has collected all mulch from my land and burnt. I think he did with good intention of keeping my land clean and I got the point but that is not what I wanted ! When I asked from him he said, if he will not burnt the mulches will spread around the farm land so he collected at one place and burnt :). All who knows about Natural Farming may tell him as fool as he burn the mulches but this is what I have noticed most of the farmers in Andhra pradesh do. They collect the mulches from the land and burn it. Is it right to say that I know little better than them in terms of farming knowledge that Mulch is not the thing to burn but to save and spread over the land :), its like money on the land that keeps moisture in the land, become organic manure after few days or weeks. What do you say, am i right? Was searching for water harvesting techniques as the ground water anywhere in the world is declining day by day. While digging for water harvesting, I came to know about APWALTA act (Andhra Pradesh Water Land and Tree Act (2002) that was later amended in 2004. There is a mis conception among people that this act restrict people from digging bore well within the vicinity of 250 meters, that is true in case existing bore well is a source of drinking water for the public in common. This act doesn't tell anything about the irrigation bore well in the vicinity. Of course, people should take permission if such bore well is being dug within the vicinity of 250 meters of public drinking water source. There is also terms of seeking permission for any bore wells in general that allows people to claim for insurance amount of Rs. 10,000/- in case bore well fails to give proper water. However the permission taking costs money of approximately Rs. 1200. This is what I could interpret after reading hundreds of pages document related with AP WALTA act. If anybody want to clarify any of its point related with what I have mentioned above, you are welcome. I was so excited that I couldn't stop myself from spreading live fencing seeds across the border of the Farm. These seeds I collected from nearby my apartment. There are a lot of trees nearby my apartment and it looks something like "Caesalpinia Sappan" but not exactly same. Apart from those seeds also spread Pumpkins, Papaya etc. Even if one or two of those seeds germinate, I will be more than happy ! I was searching for techniques interested in Rain Water Harvesting and found this group "rainwaterharvesting". 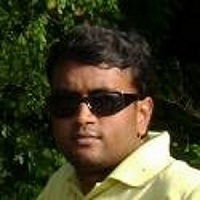 In search of people interested in Natural farming, I found Mr. Raju Titus blog and from there I found this nice yahoo group http://groups.yahoo.com/group/fukuoka_farming/. If you are interested in Natural farming, you will find like minded people in this group. I found members of this group very helpful and co-operative. Perhaps a good group to be in. The land we got in Hyderabad, the first thing I decided to get the fencing done. Earlier people said it would take around 52K to get the fencing done but it came around 1.25 Lacs to get it done. Almost triple from the budget. Total : Rs. 1.25 Lacs approximately. One thing I noticed that now after fencing the land is looking beautiful and large. Spent almost triple the amount of budget, was not expecting this much but I had to get this done. What's next? Need some more work, will keep updating here. I did see another land in Hyderabad and the agreement is done. Little bit about how it happened. One fine day (Shivratri), I just called one of the broker number I had get from Internet and he said that one land is available. I immediately scheduled a visit on the same day. 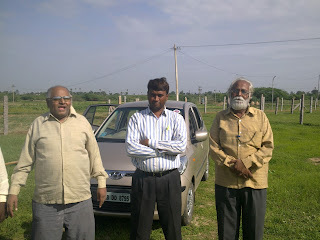 We all (complete family) went and saw that land, it was around 3 acres land, pure agricultural land. Just beside this land, Brinjal, Chillies, Onions, Paddies and others stuffs are planted. Two bore wells are also beside this land, not in this land. In one look I loved it and decided to buy it. Broker talked with the land lord and we went to the land lord house and took all the xerox of the document. Was trying to bargain the price and after several days of whether I can afford or not and talking with Broker, Land lord we settled down with the final price. Got the measurement done (a long story short, here also I got frustration but little less), please takes money but do not do things right. We were planning for the registration however people suggested to go for the legal advice and I was approaching an advocate. I went to him and he asked for Khasra Pahani (a document that tells the complete ownership story about that land). It took money and a lot of time to get that document. I got the document and then again a lot of things happened, finally I went to the MRO (Municipal Office) and saw the village map and was convinced about it. I decided to buy this land and got the agreement done ! Finally I didn't buy that land. It was too complicated to deal with that broker. I lost around 50K rupees in cash and got a lot of frustration. Do not want to discuss that topic any further it gives pain as I was quite hopeful about it. With all zeal and self encouragement, I had gone to buy the land. But after seeing the land, I was not very happy. It was not as explained by the broker. A lot of things happened and I am still in confusion whether to buy the land or not. You know broker never tells truth so there are many stuffs that I am getting from left-right side or after directly talking with the land lord. Hope to see something great soon. For last several months, I am keep watching farming videos of YouTube.com (especially Natural Farming, Zero Budget Farming, Organic Farming). There are not a lot but few of the videos are awesome and they tell real story. Mr. Bhaskar Save, Mr. Subhas Phalekar and others Indian videos are real story videos and they tells the truth. Videos from other countries tells about Organic farming but actually they are not. 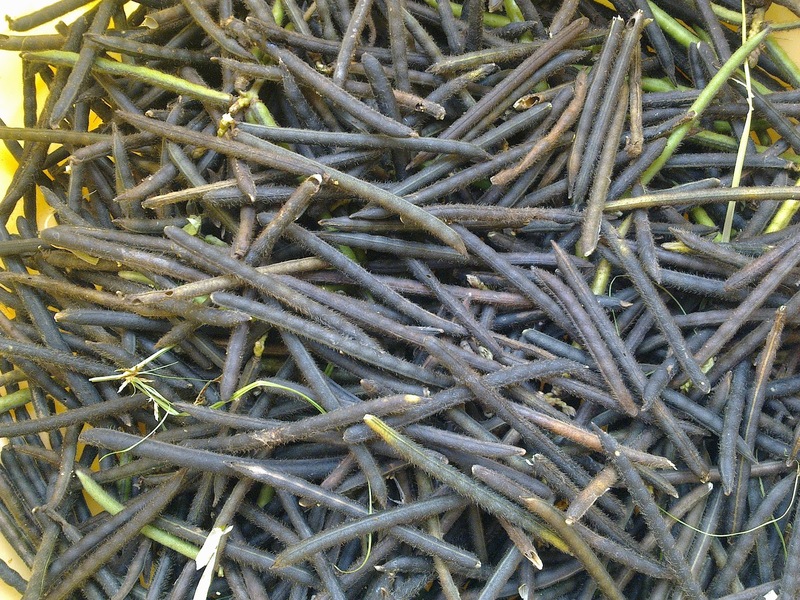 The only difference is that they do not use Chemical but the methodology of preparing the organic fertilizer is completely mechanised so its not natural and it takes a lot of time and effort to prepare them. Indian videos and farming methodology shown in those videos are out of the box. They do not talk about machine, even a tractors. Indian farming are no tilling, no ferilizing, no pesticid, no chemical, no hard work farming. Its awesome, Our ancestors were great master piece. Some of the Indian chamchas of gore people have made India like this that is why farmers are doing suicide and still these so called Indians are dominating because of their money power and influence. Follow the Indian ancient methodology of Farming and become peaceful and rich !@@!!! Sometimes I think whether it is right? I talked with some of my near and dear folks about my decision that I am going to go ahead with the Farming and looking for land. I hardly find anyone who tells its a good decision. One of my friend who is Chartered Accountant said its close to suicide. Farmers in India suicide what you will do with the farming except suicide. But I feel is this right, when I think patiently I feel its not. After all we all are one or the other way belog from farmers family and we have grown up seeing all these things. After reading a lot of books, articles, watching a lot of videos I feel its not close to suicide. Perhaps there is a big gap in terms of knowledge on how to do farming. There are hardly few farmers who are really successful but Govt. and other agencies do not encourage them and spread the knowledge about it due to their vested interest. The next 5-10 years will be of Indians and India will grow many folds. Naturally people will eat and they will eat good food. The polution will grow, the life style will change and ultimately many folks will be out of race due to life style diseases and many will give up. I think this is the right time to move forward and try something unique and that is what I am going to do. Someone may say I think too much or I am mean minded. At least I do not care as long as I feel whatever I am going to do is right and I feel whatever I am thinking is right and I can do farming easily. I may not earn millions but I will earn a good health for myself and my family for sure. All set to go to see the land and surroundings. Presently at Hyderabad International Airport. Hoping for the best, lets see. Few weeks before it used to be so fast, when Monday comes and then Sunday I used to feel it yesterday was Monday and again its Monday but this weeks waiting for Friday and its looking like weeks to come Friday from Wednesday !!!! You must be thinking that I do not have patience, yes I do not have patience for at least this cause !!! This weekend I am flying to see the land and its surroundings. Tried a lot to spot the land in Google map as per the description given by the broker but couldn't find it. Lets see if I see any new surprise while seeing the land. At the time of discussed, the broker told that the land is 4 acres but after measurement it just got 3 acres only. Again they were telling lie. Do not know how much more such incident I need to face. Not sure if I will be able to create a good small farm in 3 acres of land. Finally heard that the land measurement is going on at the site. 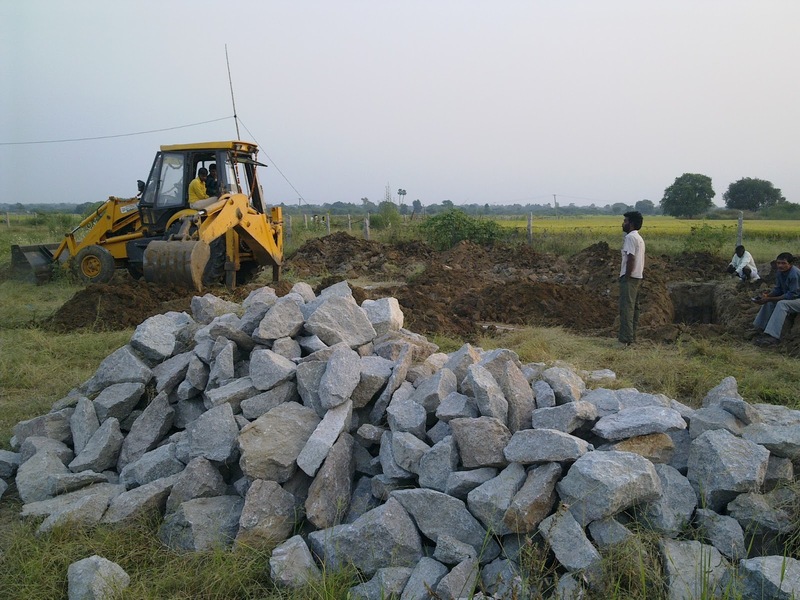 Its a 10 acres land so land owners of nearby area have come to ensure that the measurement is right. I am just getting few acres from this big chunk. Just heard that back side of this land there is a river and it is pure tand (waste land), no cultivation has been done till now. Still I need to see this personally with my own eyes. Lets see what happens in the evening. As expected, today also the broker said at the last moment that land measurement will not be done and it will be done tomorrow for sure. After a long wait, finally my broker said that today we are going to measure the land. Lets see if this is going to happen or this is also one of the fake promises by those guys. Hope everything will be alright, finger crossed. Was in search of land for starting a farm. It takes month to find out the land, naturally through broker. It seems there are hardly any land sale ads available for direct sale. There are many broker who misguide people and scare them. Land with no value is hyped by these brokers. For a normal person, its became a nightmare to buy a farming land in India. There are acres of land available in India but neither the land owner is cultivating anything nor he sells the land because of false promises by brokers. When I zeroed in to few lands, because of broker play I realized buying land is like meeting with God. Still struggling with the long process and false promises by brokers. The price of lands have gone up like anything and I found that it is more because of these brokers commissions. We have just now booked a new domain www.farmingfunda.com today and have created this blog as well. FarmingFunda.com will be the platform for us to spread knowledge about Farming (in particular Natural Farming) to the whole world. Bread and butter in your mouth.